Merry lazy-days-after-Christmas! You know what I’ve been up to? Nothing at all. What a fantastic feeling. We’d been going full blast for weeks. Holiday festivities added to already full schedules with a big dollop of craziness (that I’m not going to get into) to top it all off. Shortly after Christmas dinner, my guys and I just sort of melted onto the couch. We’ve pretty much been there ever since. The most ambitious thing we’ve done in the past few days was to go out and see a movie and then walk home along the water. Hope you’ve been able to kick back and recharge a little too. 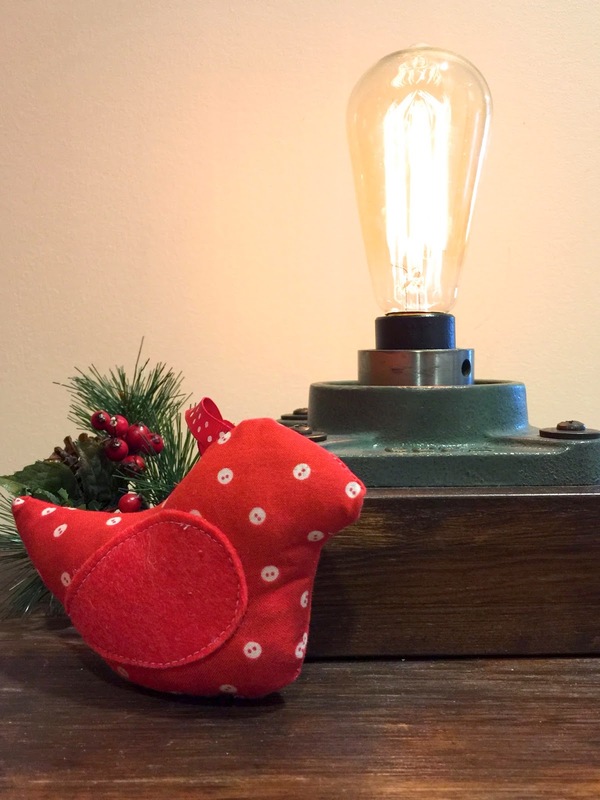 I’ve been churning out these cute little birds in my studio this past week. I made the first one as a prototype for one of my students. I made a second one alongside her during our lesson. I liked them so much I ended up making four more so I could have a whole set to bring home (I like things in sets). Since most of my sewing students are children, I’m always on the lookout for projects that are simple yet charming. I also try to introduce new skills to my students with each project. These little birds are a perfect next step to last week’s felt coasters. Once again, sewing the birds requires using the sewing machine to sew curves. With the coasters, the kids could experiment and go crazy with their curves. But this time, we up the ante by sewing neatly along the curve of the wing and the bird body. These small projects are perfect for the kids. Short enough time-wise so they can take a finished project home after a lesson or two. But at the same time, really good practice for various sewing techniques. A template for the bird body. Although I drew my pattern freehand, I based this bird body on the “bejeweled bird hanging” project from “All Sewn Up” by Choe Owens. She includes templates in the back of her book that you can copy and enlarge. I have no patience with the copy machine so for something small like the bird, I prefer to just draw my own pattern to whatever size I want. Fabric scraps for the body. I went with the Christmas-y colors of red and green. Felt scraps for the wings. Buttons if you want your bird to have eyes. Cut two bird bodies from your fabric. Cut two wings from your felt. Sew one wing to each body piece. This can be done by hand or on machine. Try to sew uniformly about the edge of the wing. If you want button eyes, then I recommend stitching on the buttons before you sew the two sides of the body together. Be sure to set the eyes in away from the edge of the fabric since you’ll still need to sew around the bird body. Once the wings are sewn onto each bird body side, pin the two sides together with right sides of fabric facing in. If you want to hang your bird, then tuck and pin your bit of ribbon inside the bird (loop hanging down). Ribbon loop will be sewn on when you stitch around the bird body. 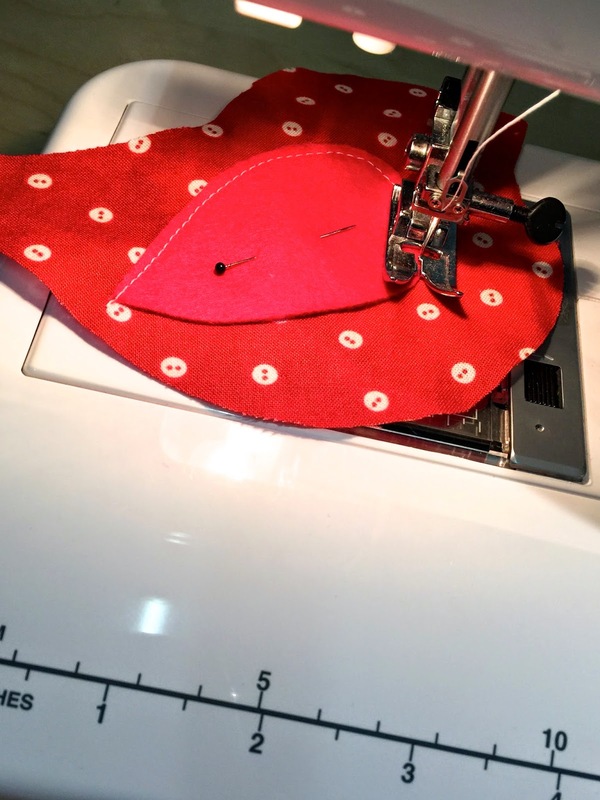 Sew around perimeter of bird body. Leave a length open so you can flip fabric and stuff the bird. Clip fabric edges around the curves (under bird neck and along the back). Be sure not to cut your seams. Whip stitch (or slip stitch) the open seam closed. And there you have it. 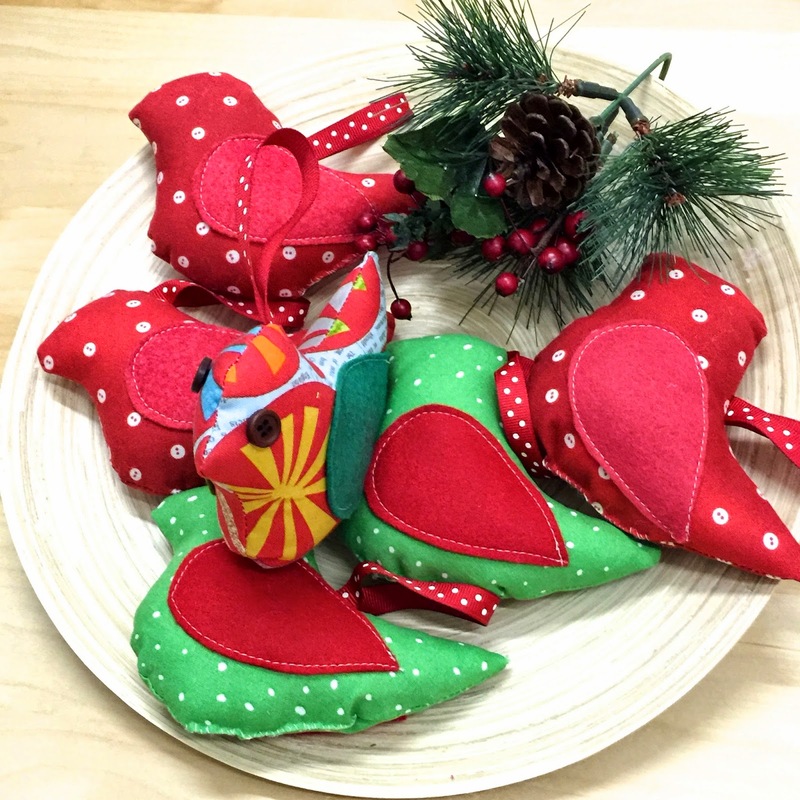 Pretty little birds that you can hang on your Christmas tree, add to a wreath or just tuck into quiet spot to add a little holiday handmade warmth to your home. Part of our family Christmas tradition is to bundle up, brave the crowds and check out the city’s Christmas decorations. First stop this year was the Rockefeller Center Christmas tree. I especially like watching the flags whip around in the wind. 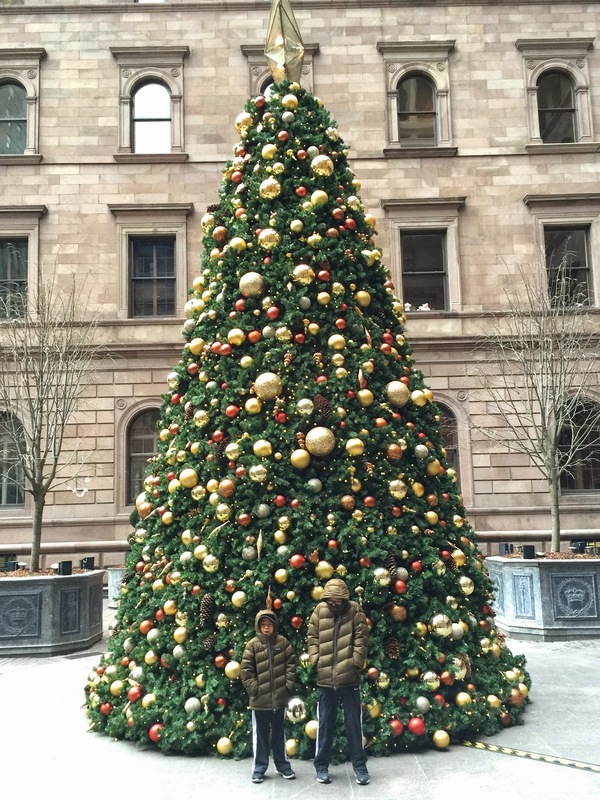 Next tree was in the courtyard of the New York Palace Hotel. In our early NYC days, Jin and I used to stand hand-in-hand outside this courtyard at night. We loved looking at the lights and marveled at the sheer richness of this city. 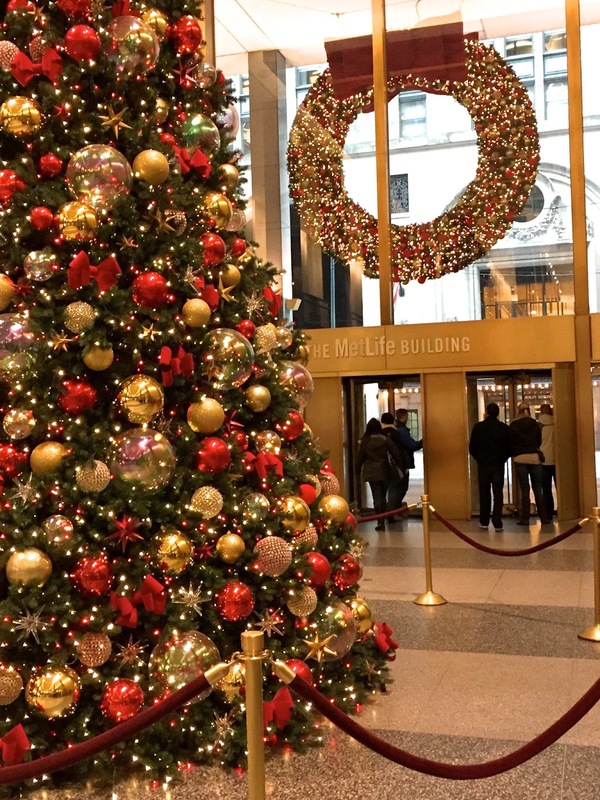 Third tree in the lobby of 200 Park Avenue. Sure, it’s just another fake tree in a big lobby. Here’s where we first worked when we transferred from San Francisco to NYC. Geez, was that really 20 years ago? Last tree at Broad St (by Wall St). This big tree in this quiet corner of the city is actually my favorite. From here it was a brisk walk home for cookie baking and gift wrapping. 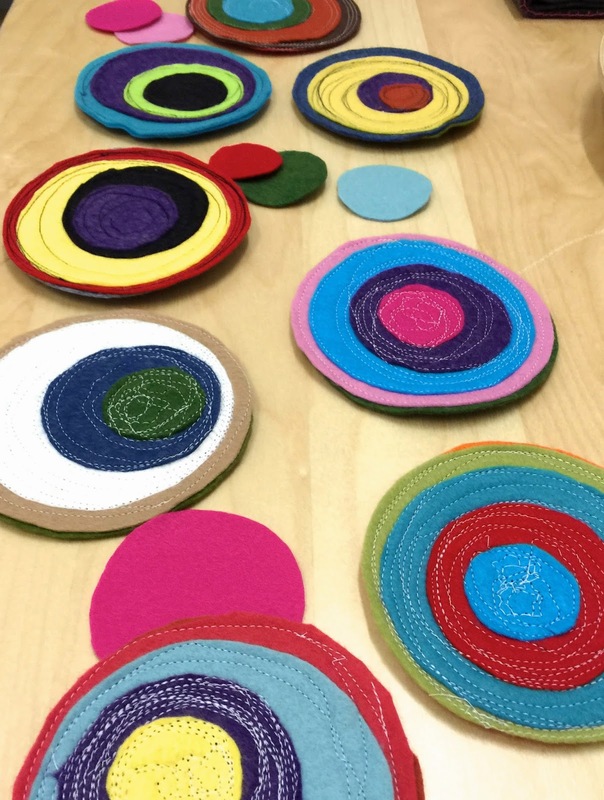 I’m super excited about these felt coasters my sewing students and I have been making this week. They are the perfect no-stress way to practice sewing curves on the sewing machine. The end product is a nifty looking (dare I say, Kandisky-ish) functional coaster. Instructions for this fun project can be found here. Thank you to Nancy of “Do Small Things with Love” for dreaming this up and for the tutorial. 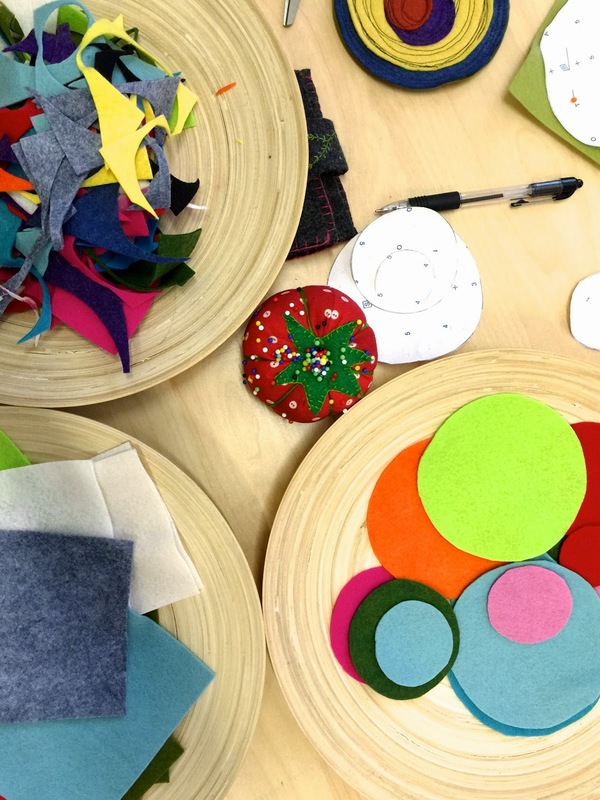 If you have enough felt, you might consider cutting an assorted palette of felt circles. Vary the size and colors. This is a little time consuming, but I think it’s worth it since you can mix and match your felt disks until you come up with the perfect color combination. As I said earlier, this activity is a terrific way to practice sewing curves. You can challenge yourself to edge stitch uniformly around each new round of felt but imperfections on this project can only make things more interesting. Remember to keep your fingers away from the needle as you slowly spin your coaster round and round as you sew. If anyone is looking for handmade gift ideas, I think four of these coasters tucked into a matching felt envelope would make a fabulous Christmas gift. When I think of “family adventure,” I usually think of palm trees and sand. Or Mickey Mouse. Or even an exciting day trip to visit a new exhibit at one of our wonderful NYC museums. I can’t say I’m thinking about a downstairs school cafeteria painted institutional green and yellow. Nor am I thinking about processing mountains of frozen fish or chicken. Or figuring out how on earth I’m supposed to stretch 2 big cans of tuna into 50 sandwiches. But, as I take a moment out of our frenzied holiday preparations to ponder this, I realize that my family’s trips to a local soup kitchen should absolutely count as one of our great adventures. 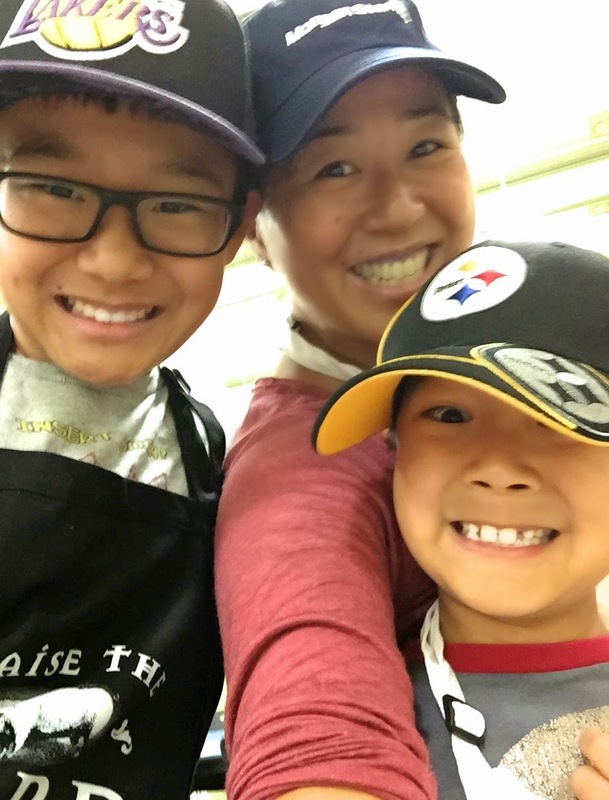 We volunteered for the first time at the Xavier Mission Welcome Table last Christmas. We had no idea what to expect. We only knew that since our children were underage, we could help only in the preparation (but not serving) of that Sunday’s meal. 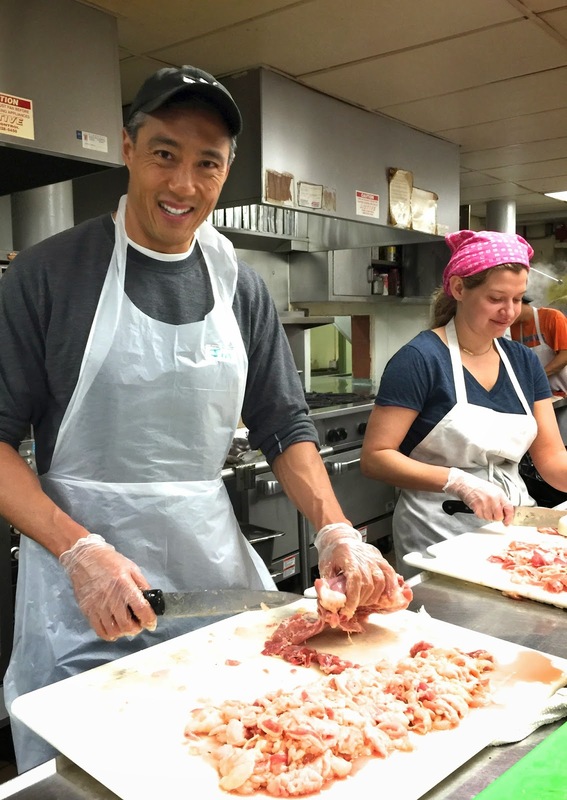 We signed in at 8:45am, put on aprons, hair nets and gloves and then were put to work at various tasks. All four of us worked hard at different jobs all morning, but I think my husband’s job of cooking a vat of chili in a ginormous pot had to be the most impressive. Fast forward one year later. We’re still volunteering once a month at the Xavier Mission Welcome Table. 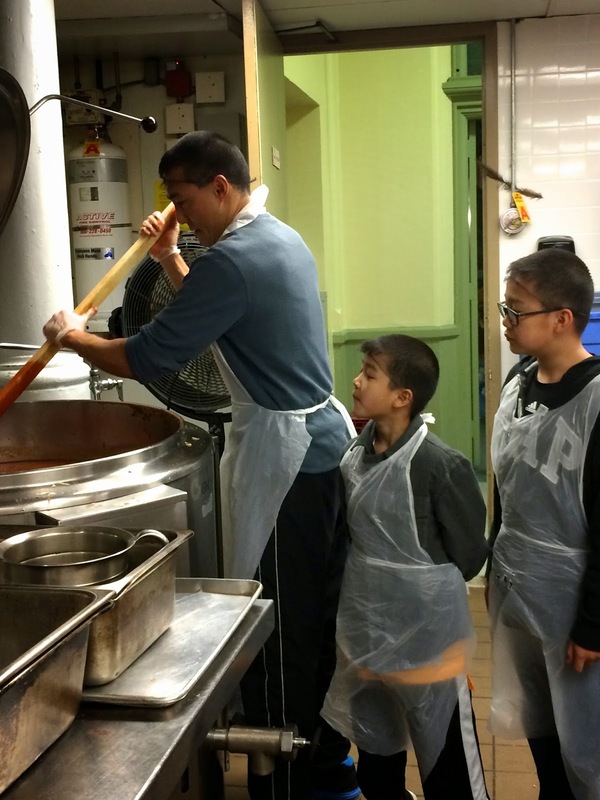 The soup kitchen serves 1000+ people a hot meal every Sunday. But the boys and my primary responsibility each visit is to make 50 bagged lunches to hand out to those who need something to take away instead. Some months, there is plenty of food and then bagged lunch making goes lickety-split. Other months, it seems that we’ve run short on everything except packs of salt, pepper and ketchup. That’s when I want to pull my hair in frustration and sadness because I’m imagining that hungry someone squeezing ketchup out on a dry roll and thawed lunch meat trying to make the food palatable. Once we finish our primary lunch packing task, we look to our Sunday’s coordinator (the ever cheerful Jennie) to see how else we can help. The boys are often set to wrapping utensils and salt/pepper packs in napkins. They also separate and sort plastic bags and take out containers. Occasionally, we’re asked to pour and stack cups of juice. By the way, pouring and stacking 1000+ cups of juice in light weight plastic cups is not a trivial job…. It’s amazing to see all the volunteers who show up month after month to help out with this Sunday meal. Some of the folks have been volunteering 20+ years. I am inspired… touched… humbled. My boys take this once-a-month morning’s work very seriously. They rejoice with me when there is food to distribute. And share my frustration when there is not. They look for ways to be helpful. And wonder if there are ways to be more efficient. They pack, sort, clean and learn. And I hope they understand. Of course, soup kitchen must be counted as an important family adventure.